Determine the midspan value of EIδ for the beam loaded as shown in Fig. P-680. Determine the midspan value of EIδ for the beam shown in Fig. P-679 that carries a uniformly varying load over part of the span. 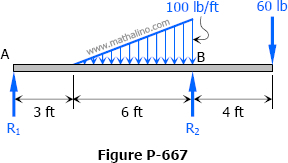 Determine the midspan deflection of the simply supported beam loaded by the couple shown in Fig. P-676. Repeat Prob. 674 for the overhanging beam shown in Fig. P-675. Determine the value of EIδ at the left end of the overhanging beam shown in Fig. P-670. Compute the value of EIδ midway between the supports of the beam shown in Fig. P-669. Determine the value of EIδ at the right end of the overhanging beam shown in Fig. P-667. Is the deflection up or down? Determine the value of EIδ at the right end of the overhanging beam shown in Fig. P-666.